If you like wine — and since you’re here on wine.com I’m assuming that you do — you’ve probably heard of Prosecco. You might well have tried it and you might even be a fan, like millions of others throughout the world, but there’s much more to this quintessentially Italian bubbly than most people are aware of. There are a few important things you really need to know to help you find the one you’re really looking for, that is, the one you’re going to enjoy the most. To begin with, you probably know that Prosecco comes from Italy, in the northeastern corner of the country, but did you know that there are actually three Proseccos? And, while all three share some common factors and are produced in the same general area, there are some critical differences between them. In a nutshell, it comes down to two things: terroir and tradition. Prosecco DOC, created in 2009, is produced in an extensive area encompassing two regions of Italy — Veneto and Friuli — 9 entire provinces, and 556 towns. Because most of the growing area is located in flat plains and valleys, the yield of grapes per hectare is much higher and many of the vineyards can be (and are) harvested mechanically. Despite the fact that this is a new appellation, Prosecco DOC now accounts for about 80% of all Prosecco produced. Colli Asolani Prosecco Superiore DOCG, also created in 2009, is a small area located in the hills around the town of Asolo in the province of Treviso. Though wine has been produced here for a long time, until bubbly Prosecco started to boom, the real focus of this region was — and in many ways remains — still red and white wines. The Colli Asolani area currently produces about 1% of Prosecco. 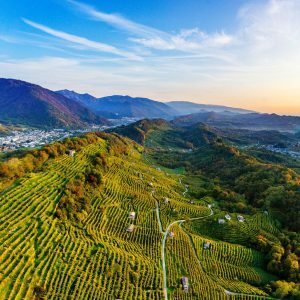 Conegliano Valdobbiadene Prosecco Superiore DOCG is a small area consisting of 15 municipalities (most are sleepy villages) in an east-west swath of hills located right in the middle of the greater Prosecco area. This is where the Glera grape — which must make up at least 85% of all Prosecco — first found its ideal home and this where the wine we now know as Prosecco was born. 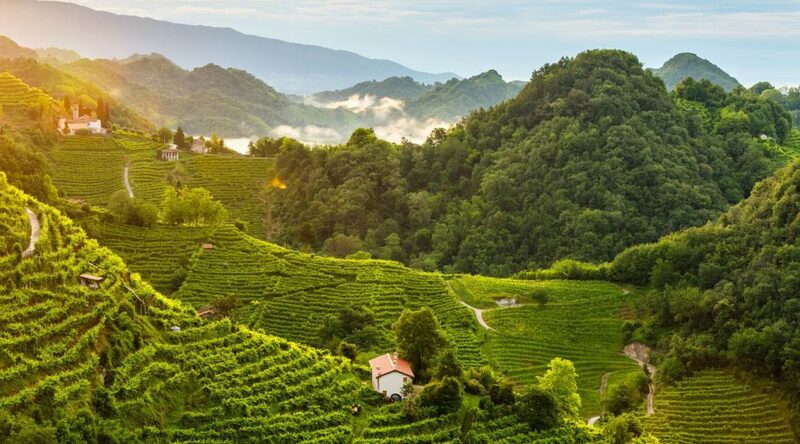 Grape growing and wine making have been taking place in Conegliano Valdobbiadene (ko-neh-yee-ah-no val-do-bia-deh-nay) for hundreds, perhaps even thousands, of years and the vines have been painstakingly handcrafted over time to fit the undulating contours of the hills. Even today, most of the work in the vineyards is done by hand by thousands of independent farmers on small family plots who supply grapes to the 178 wineries. The “Italian Method” of making wine sparkle was developed around the turn of the 20th century at the enology school in Conegliano (founded in 1876, it is Italy’s oldest and remains a vital and important institution to this day) and the very first Prosecco appellation was created by a Consortium of Conegliano Valdobbiadene producers in 1969. Conegliano Valdobbiadene occupies an exceptional geographic position: the Dolomite Mountains just behind the hills blocks the harsh northern temperatures while the Piave River Valley at the foot of the hills forms a plain extending south all the way to the Adriatic, bringing warm sea breezes that ventilate the vines and create a unique combination of Alpine and Mediterranean influences. Even within the small area of Conegliano Valdobbiadene there is a tremendous diversity of microclimate due to its complex geological history. The Conegliano (eastern) section was shaped by glacial activity from the Dolomites that shaved off the tops of the hills and carried it downwards along with lots of other glacial material extending the hills to the south (you can see this as a heart-shaped bulge on the map). For this reason, the altitudes here are lower, the slopes gentler, and the soils are denser, with lots of ferrous and morainic deposits. The western Valdobbiadene side was little affected by glaciers, so the altitudes here are higher, the slopes are much steeper, and the soil contains an abundance of marine deposits (the entire area was once under water). In between these two extremes is a myriad of environmental variations. The long viticultural tradition and great diversity of terroir within the Conegliano Valdobbiadene area is reflected in the wines that are made here. In 2009 a sub-category called Rive (ree-vay) was created, which indicates a Prosecco DOCG made entirely from grapes of a single village or hamlet. The grapes must be hand-harvested, the maximum yield of grapes is lower than that of a regular Prosecco DOCG, the wine must be vintage-dated, and the name of the Rive — of which there are currently 43 — must appear on the label. Besides the village/hamlet designations, a Prosecco may also be made from grapes of a single specific vineyard (this is a winery decision and not part of the officially regulations). Then there’s the legendary Cartizze subzone, known as Valdobbiadene Superiore di Cartizze, an entire south-facing hillside in Valdobbiadene of 106 hectares with over 140 proprietors. While we all think of Prosecco as a sparkling (spumante) wine, it also can be fizzy (frizzante) and there’s even a rare still version known as Tranquillo. While the Glera grape is the principal player in Prosecco, there are also several other native varieties of Conegliano Valdobbiadene that can make a notable impact even in small quantities (especially if they come from old vines, of which there are many in the area). The amount of residual sugar in a Prosecco DOCG also varies considerably and makes a huge difference in the final product. “Dry” (with 17-32 grams of residual per liter) is actually the sweetest type of Prosecco; “Brut” (0-12 grams per liter) is the driest; and “Extra-Dry” is in between. Finally, while the vast majority of Prosecco Superiore is made using the Italian Method developed at the Conegliano enology school over a century ago, it is also possible to conduct the second fermentation in bottle, either in the traditional process known as Col Fondo in which the sediment (fondo) is left in the bottle, or the Metodo Classico in which it is removed. There’s something for most every palate and every occasion so dive into Conegliano Valdobbiadene Prosecco DOCG and have fun exploring what makes it simply, distinctively Superiore!